To be able to read schematics you must know the schematic symbols. Here is an overview of the most used symbols in circuit diagrams. The symbol for a battery is shown below. A large and a small line is suppose to represent one battery cell so that the image below would suggest a two-cell battery of 3 V. But usually people just draw the battery symbol with one or two cells no matter what voltage it is. Capacitors are either polarized or not. The symbols that are used for the two are shown below. Both in European and US style. A polarized capacitor is marked with a “+” sign. It is important to distinguish between these two because the polarized capacitor needs to be placed correctly according to the “+” sign. The schematic symbol of the resistor are drawn in two different ways. 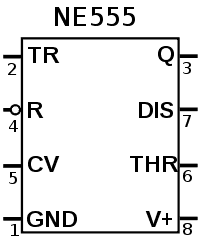 The american style resistor is drawn as a zigzag resistor while the european style resistor is drawn as a rectangular resistor. Even though I’m from Europe, I like to draw the zigzag version. I think it is easier to draw and looks better. The variable resistor or potentiometer is drawn in several different ways. The symbol is often drawn as a resistor with an arrow across it or pointing down on it as the one below. The diode family has several different symbols because there are several different types of diodes. Below is a standard diode, a zener diode and a Light Emitting Diode (LED). The most common transistor types are the Bipolar Junction Transistor (BJT) and the Field Effect Transistor (FET). 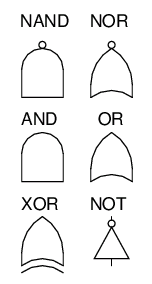 The schematic symbols for these two types are shown below. The inductor symbol looks like a coiled wire as this is what an inductor essentially is. Integrated circuits (IC) are usually shown as rectangular boxes with pin names. Below, an example of the 555 timer IC is shown. Here are the schematic representation of the 6 logic gates. The operational amplifier or “Opamp” is represented as a triangle with two inputs and one output. In some cases, the power supply pins are also added. Below, a version without power supply pins are shown. A switch can be represented in numerous ways in electronic schematics. Below is one example. The symbol of the transformer looks like two inductors with something in between them. It would be nice to also include the european version of the logic gates. Also I prefer the european version of the resistor since a sloppy drawn zigzag might also be a coil. Good point. I’ve always found the european version of the resistor a bit boring. But I see your point about a sloppy drawn zigzag-resistor. Yes that is a good point. I’m always critical of fine points like that, that a lot of people don’t think of. But I’m an OLD guy now (been around for a long time), and I’ve used the zigzag resister symbol all my life. My response then is if it’s sloppy and can look like a coil (which is true), just don’t be sloppy! Another thing: The European style symbol can look like an object on a computer flowchart, many of which I have also made. So I’m not crazy about it’s boxy look because I’m used to that being on flowcharts. thanks nice course for me Ilove thise help me brother. Not sure what you mean… A PCB does not have a symbol. a PCB is the board, but some of the capacitors have difference marking for the cap. positive. What’s the usefulness of this comment? It’s basic electronics for people that don’t know it. And please do forget co the link. *And please do forget to share the link. God bless the developer of this site and the above writer-up . I have really gained a lot today. But , I will appreciate if u can write up how to configure the pins in an integrated circuit as well as what each term stands for? God bless you…. Can you please explain how to reverse engineer a schematic from a circuit board? On schematic, resistor with % mark instead of resistance? That’s the precision of the resistor. 5% means the actual value is within +/- 5% of the marked value. Thank you for your tutorials! Is it possible to have a printable link for some of your pages, like this one? Thanks! I don’t have any way of offering that at the moment, but you could try just the print option of your browser.